Having shined as the sun on Athos. Now you delight in the good things of the Lord. You are the boast of the Venerables O right-minded George. Our holy Father Euthymios was from the town of Tao in Georgia . He was the son of pious, noble and wealthy parents. When his father renounced the temporal and perishable splendor and glory of this world, preferring poverty in Christ which leads to heavenly riches, he donned the angelic schema of a monk, changed his name to John, and moved to Constantinople. Euthymios, who was still quite small, stayed with his grandfather (though some sources say that Euthymios was left with John’s brother-in-law) a man renowned in glory and in virtue, who raised the child in the instruction and admonition of the Lord. After a little time had passed, he took Euthymios with him, and they went to Constantinople looking for John. When he found him, he urged him with many words and tears to come back to his country. Not only was John not persuaded by this, he tried in every way to keep his son with him, thereby causing the boy’s grandfather great sadness. Since they quarreled a great deal about this, and because John tried to take his son and his father would not allow him to do this, the Emperor Nikephoros Phokas (r. 963-969) learned of it, and commanded that both men appear before him and bring Euthymios with them. After the three presented themselves to the Emperor and he had heard the argument they had about the youth, the sovereign decreed that neither of them should take him by force. They were to leave it to God to decide what to do with him. He also told them to let the youth go to whomever he freely chose to go. He ran at once into his father’s arms, though he had never seen or known him until that moment. This action evoked wonder and tears in all those who were present. The blessed John received his son as if from the hands of God and soon clothed him in the monastic schema. They then departed for Mount Olympus of Bithynia to live as monastics, but shortly after John sent him to Constantinople to teachers in order to be educated. The good Euthymios, having a sharp mind, much fervor and diligence, soon learned worldly wisdom and also the inner wisdom of God from his instructors. So he appeared as a river of the teachings of the Spirit. After this, he returned to Mount Olympus and soon he fell gravely ill, but he recovered through the care and help of the Most Holy Lady Theotokos, who had appeared to him. This visitation of the Theotokos also endowed him with proficiency in the Georgian language. He excelled in virtue, wisdom, and grace, and in many other wondrous things from which it was apparent to all what sort of prodigy he would become. The blessed one despised the glory of men as something contrary to the glory of God, so he left and went to Mount Athos with his father John in the 960's. After meeting Saint Athanasios (July 5), they desired to live with him in Great Lavra. The divine Athanasios, seeing with the clear-sighted eye of his soul the grace of the Holy Spirit dwelling in Euthymios, urged him to receive the dignity of the priesthood. At first he did not wish to do so, saying that he was not worthy of it. Finally, he obeyed the words of the holy Athanasios and was ordained as a priest. From that time he began to add struggles upon struggles, abstinence on top of abstinence, and greatly increased all the virtues that he had. As a result, he became a vessel of the All-Holy Spirit, and translated all the Holy Scriptures into the Georgian language. He also wrote many books filled with his teachings on morality and virtue. 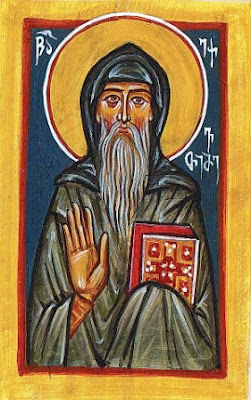 Saint George of Mount Athos (May 13 & June 27), the author of the Life of Saint Euthymios, says that the Saint translated the Holy Scriptures, and more than fifty other works, into the Georgian language. He also rebuilt many churches and hospitals, and adorned the Holy Mountain with hermitages. With what words can one describe worthily the kindness which he showed toward all or his incomparable humility when for fourteen years he cared for the great Athanasios and his father who were ill? Once these two had gone to the Lord, the blessed Euthymios was given the protection of Great Lavra, and not just the Lavra, but all of the Holy Mountain. In this he was willing and quick in his dual healing of the souls and bodies of the brethren. His divine mouth always spouted forth rivers of wisdom and instruction to the glory of God. Since he was overcome by the love of extreme tranquility, he made his cousin George the abbot of the Lavra. Euthymios remained alone, pleasing God night and day. No one knew of his spiritual struggles and their fruits, because he strove to accomplish them in secret, so that no one should know of them but God, Who wished to reveal the many accomplishments by which His servant shone forth. John Tornikios was a general in the Georgian army and the brother-in-law of John, the father of Euthymios. He had become a monk in Georgia, then left in search of his brother-in-law at Mount Olympus, though John and Euthymios had since departed for Mount Athos. Tornikios therefore met them at Great Lavra. When Emperor Basil II (r. 976-1025) faced the rebellion of Bardas Skleros, he sought aid from the Georgian king. The Georgian king asked for the aid of Tornikios, who went to Georgia and led an army of twelve thousand Georgians, successfully putting an end to the rebellion of Bardas. In return for the help of the Georgian king, Emperor Basil gave Georgia extensive territory along the Roman-Armenian border. Tornikios returned to Athos and resolved to establish a new lavra for Georgians at the Monastery of Klementos, given to him as a gift from Emperor Basil. The emperor also gave Tornikios the Monastery of Kolobou. 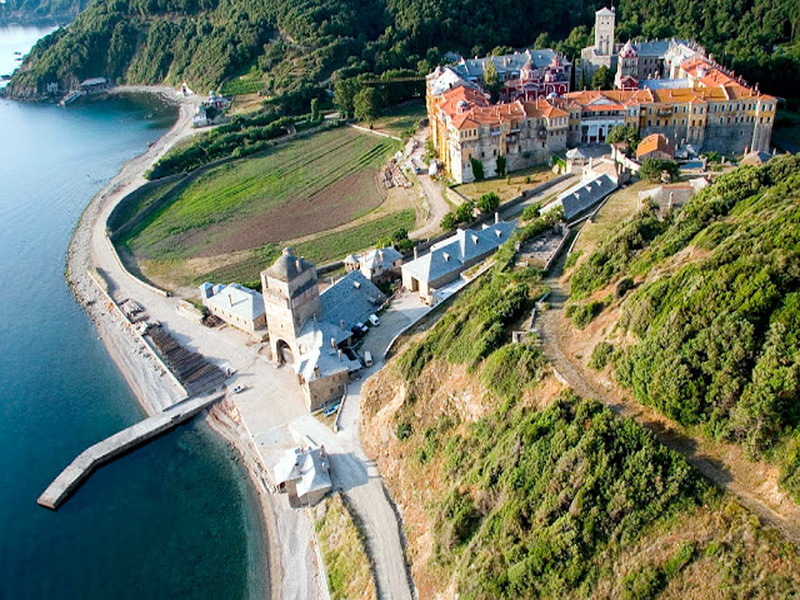 Both of these monasteries attracted many Georgian monks to come to Mount Athos. Many Georgians also entered Great Lavra, therefore to avoid factions Saint Athanasios gave them property a thousand paces away from Great Lavra, where they were to establish their own community. This new monastery was dedicated to Saint John the Baptist and called Iveron Monastery. The name "Iveron" refers to the fact that it was founded by and consisted of Iberians, namely Georgians. Once there was a drought on the Holy Mountain, and all the Fathers were immeasurably sad because of the lack of water, so they begged the saint to pray to God about this. The blessed one was persuaded only with great difficulty. He climbed to the chapel of the Prophet Elias, which is near the Holy Monastery of Iveron, praying with tears to the All-Merciful God, offering to Him the rational and bloodless Sacrifice. Immediately, so much rain fell that the ground was saturated. Everybody glorified God, Who glorifies those who glorify Him. It is customary for the monks on the Holy Mountain to ascend to the summit of the mountain during the all-radiant Feast of the Transfiguration of the Savior (August 6), and to serve the all-night Vigil. The next day they celebrated the Divine Liturgy, and then came back down. 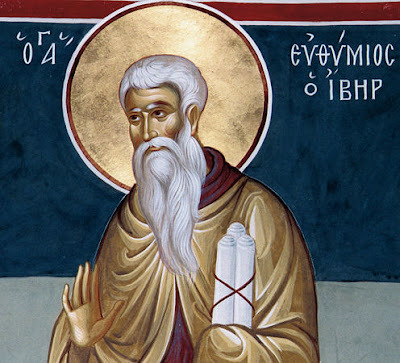 Once, when this Great Feast had arrived, Euthymios ascended the mountain with many others just when it time for the Divine Liturgy to be celebrated. With one voice they all begged him to serve the Divine Liturgy and he fulfilled their request with great humility. He came to the exclamation where the priest says, “Singing the triumphant hymn, shouting, proclaiming, and saying....” Suddenly a blinding light flashed about all of them and the earth quaked, and everyone fell face down upon the ground. Only the blessed Euthymios remained standing motionless before the altar, appearing as a pillar of fire. This wondrous event made him even more renowned everywhere. When the Archbishop of Cyprus departed unto the Lord, the Emperor Basil II (976-1025) sent envoys with letters, fervently entreating Euthymios to accept the position. The saint would not even consent to hear the whole message, saying that he was not worthy of the appointment. Indeed, he said, he felt more worthy to be shepherded than to shepherd others. So Euthymios, in a God-pleasing manner, remained alone in stillness and quiet both day and night. In his heart was rooted humility, the mother of all virtues. Meanwhile, the apostate devil, who always bears malice and works against all good and God-pleasing works, could not tolerate seeing the saint’s virtues. He progressed each day and was very pleasing to God, and everything he did was for the glory of Christ God. The wretched one was willing to commit this act of murder. He got his knife ready and he climbed to the tower where the saint had his cell. Seeing that the man was completely dominated by the devil, and that he held a knife in his hand, the saint’s disciple closed the door to the cell and would not let him in. The murderer, not finding the saint in order to satisfy the rage which overcame him, immediately wounded the disciple and left that place amidst wild cries and shouts. He encountered another disciple of the saint and attacked him in the same manner. He went a little farther, and then fell face down on the ground. After confessing his sin and revealing all the words that the devil had spoken to him, he violently gave up his foul soul. By the grace of the Holy Spirit, the saint recognized that the accident which had befallen his disciples occurred with the devil’s collaboration. Quickly he descended from the tower, hastening to perfect his disciples with the Great monastic schema. Shortly after he tonsured them, they both departed unto the Lord. The devil could not stand to see the saint’s accomplishments which he performed for the glory of God. Therefore, he incited a gardener to slay the saint. The man had the knife ready, and approached the saint, stabbing him in the abdomen, but the saint remained unharmed. The edge of the knife bent like wax, and the hand that struck the saint withered and remained unmoving. Falling at the saint’s feet, the gardener confessed the demon’s plan, and he pleaded earnestly with Euthymios for forgiveness and healing. Being compassionate, the saint entreated God on his behalf, and so the gardener received both spiritual and bodily health. What words suffice to recount the virtues of the saint, the sympathy he had for all, his compassion, his cheerfulness, his lack of anger, his tranquility, his all-night vigils, his ceaseless prayer, and his humility, the poor quality of his food and clothing which inured his body to hardship? He also wore heavy iron chains on his body. To put it plainly, he was truly an angel in an earthly body, an unwavering beacon to the world, reflecting in his own person the word of life. Because there are scandals everywhere, and the earth is the principal place for scandal, some troubles also occurred on the Holy Mountain . Because of this, the Fathers pleaded with the saint to go to Constantinople to ask for an imperial decree to put an end to the scandals, and to restore peace on Mount Athos. Heeding their words, the blessed one went to Constantinople. The whole Senate and the nobility received him with great courtesy and much reverence. At once, his request was granted. One day, as the blessed one was riding a mule through Constantinople . He and another monk were going to the section of the city called Platia for some necessities. A beggar sat in the road asking for alms. Seeing him, the saint felt compassion and was about to give him something. The mule he was riding became startled when it saw the beggar, and it became wild. Violently carrying the saint away, the mule galloped off and did not halt until it had thrown the saint to the ground and crushed him. Some Christians ran and picked him up, bringing him back to the home where he was staying. A few days later, on May 13, 1028 he received the Holy Mysteries, and then gave his holy soul into the hands of God. During the burial of his holy body, many healings and miracles took place. These were seen as proof of his holiness and boldness before God, and they were performed for the glory of the Lord. 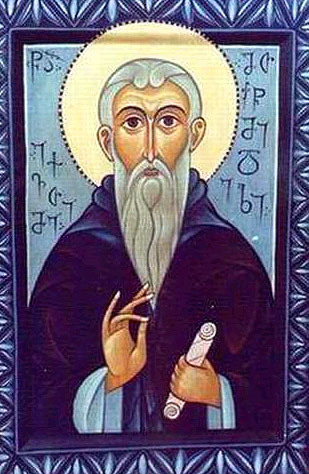 Later, his holy relics were moved to the Holy Mountain , and were buried in the venerable monastery of the honorable, glorious prophet, Forerunner, and Baptist John. Later, the monastery was renamed the Iveron (Georgian) Monastery which had been rebuilt by the blessed Euthymios to the glory of the Father, and the Son, and the Holy Spirit, one Godhead, to Whom is due glory, honor and worship, now and ever, and unto ages of ages. Amen.